Mascot Logos imprinted in black are available for no additional cost per planner. 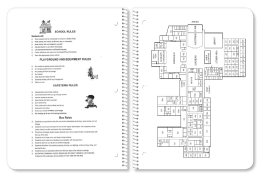 Select your mascot at schoolplanners.com/covers/mascots. Simply indicate the file name of the mascot on your order form, or submit a copy of your mascot if you have one. $75.00/per order plus an additional 25¢ per planner. As a standard feature of every planner, a 16 point back cover is included with an 8-inch ruler on the inside of the back cover. There are two free outside back cover options to choose from. 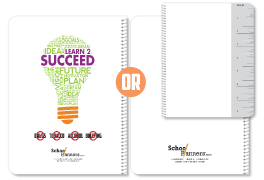 You can choose between a blank back cover, or a back cover with our "Learn 2 Succeed" anti-drug message on it. $75.00/per order plus an additional 25¢ per cover per planner. This is a clear vinyl pouch for sending notes or other information between teachers and parents. Our pouch was custom designed specifically for use in our planners. The opening is on the binding side rather than the top, which prevents items from falling out of the pouch. The pouch is made from durable 7.5 mil vinyl. Our Polyethylene cover is the most durable cover on the market. 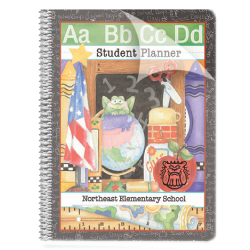 This heavy plastic overlay will protect any planner throughout the school year. 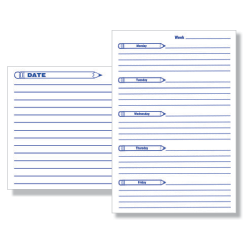 These laminated dry erase wall charts offer teachers a convenient means of communicating student assignments. Charts are 24" x 36" and available in a vertical five-day format or a horizontal one-day format. Charts only available with planner orders. 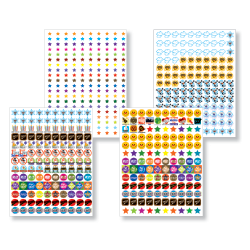 Colorful stickers are designed to highlight important activities and events during the school year and are bound in the back of the planners. 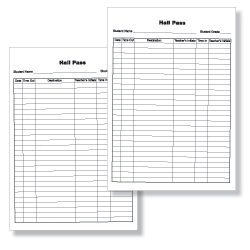 This two-sided card has 54 spaces for hall pass documentation and is printed on heavy manila stock for durability. 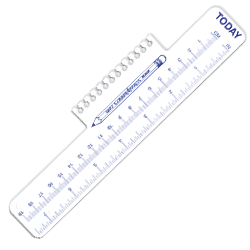 This snap-in combination bookmark/ruler has both metric and standard measurements. 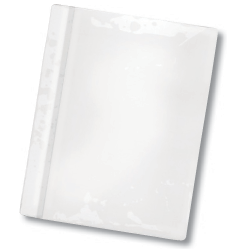 Its slot-punched design allows it to be easily inserted and removed from the binding of the planner. It is compatible with all size planners.